I’ll admit it. I love commentaries. I’m kind of a commentary junkie. 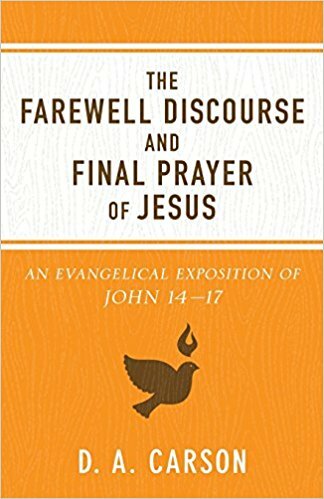 If you don’t like trudging through line after line of biblical criticism, grammatical analysis, or inter-textual dialogue, then this book is still for you. 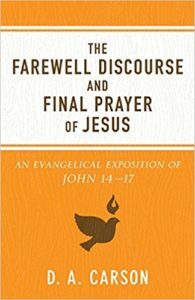 With D. A. Carson’s other, more famous work in John (his Pillar Commentary), this provides a nice companion piece. And it reads more like prose than scholarship. He opens with a narrative take on John 13, the foot washing and Judas story of the Last Supper. It’s important to frame the following, dialogue driven text of chapters 14-17 of John with the more artistic and flavorful story of the disciples’ final moments with Jesus before the cross. Context adds weight. But Carson’s work here is not light. He still deals with all the details of the text, driven by the idea of “What should we learn from this?” As such, any audience can learn something. This is a reissue of the original 1980 edition. It’s good to see “classics” coming to new light and being brought before new audiences. Carson has always been a favorite scholar of mine. In fact, the commentary I mentioned earlier was the very first one I purchased after graduating college. I’ve added several more, and I’m always willing to pick up one of D. A. Carson’s. I hope you will too. 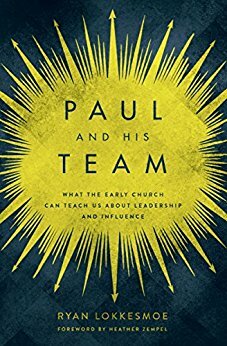 That’s not the case with Ryan Lokkesmoe’s book, Paul and His Team: What the Early Church Can Teach Us about Leadership and Influence. He first delves into what it means to ha ve influence. We all have it is some measure. And so, just as the master who handed out “talents” in Jesus’ parable, we’re expected to do something with it. Handling that influence is the essence of leadership. Next, Lokksemoe digs deep into particular Pauline passages to find the most important leadership lessons. Instead of working the text backwards (“What does this say about what I already believe about leadership?”) he works it the right way round (“How can this story, this text inform my leadership process?”). This book is great for pastors and church leaders, but can also find room on the shelf of Christian leaders – CEOs, managers, shop owners, teachers – anyone who follows Christ and has a following, basically. Pick it up next time you see it and enjoy!